Size of GIF way too high? I'm trying to extract a GIF from an MP4 video file. which gives out a file, 1.6MB of size. 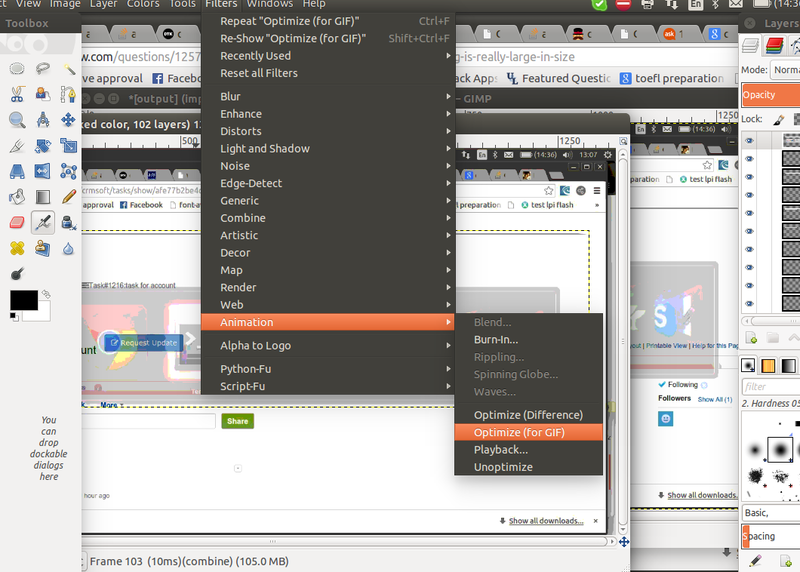 Now I can't quite see how 2 GIFs of the same fps, duration and resolution can have such a huge difference in size. My intuition would be, they should be the same. Why is there this difference? And is there any way to cut the size of 2) to the one of 1) without losing quality? Because of how GIFs work, the more complicated the palette, the resulting gif becomes larger pretty quickly. I would use GIMP to optimize the resulting GIF from #2 - not 100% sure how it works, but think it basically deletes duplicate information from one frame to the next. Not the answer you're looking for? Browse other questions tagged ffmpeg gif image-conversion or ask your own question. Efficient way to create video from looped .gif file? Combine images and gif to a single video?